The overall trade balance is composed of trade in goods and services. It used to be years ago when the trade deficit in goods began to balloon that it was no big deal because America was exporting innovative services, such as complex financial services, and they would make up for the deficit in old-fashioned goods. They did lessen the pain for a little while, and then they didn’t. And soon, even the overall US trade deficit ballooned, but it was no big deal because soaring imports showed that the US economy was healthy and brimming with consumer demand. Year after year, we heard this from economists and politicians. Beyond that, apathy was palpable. No one cared. It’s just the way it is. Dreaming of balanced trade was like so 1980s or whatever. Meanwhile, Corporate America was fine-tuning its game of offshoring production and importing from cheaper countries. The entire business model of Wal-Mart depends on it. US supply chains wind all over the globe, in search of the lowest production costs, whether it’s consumer gadgets or automotive components. It never was a big deal because growing imports were portrayed as healthy demand in the US. The world loved it. But the fact holds: exports add to the economy; imports subtract from the economy. And the new White House figured that out. Shipping jobs overseas hasn’t been helpful either. The new White House has figured this out too. And suddenly there’s a huge ruckus about something that should have caused a huge ruckus 25 years ago – before it got this far out of whack. And so this is where we are today. There are other quirks due to the opaque nature of some of the trade dealings, including transshipments, trade invoicing, tax issues, etc. For example, the US has a trade surplus of $24 billion with the Netherlands, not because the end-users of US products are in the Netherlands but because Rotterdam is a huge port for the US-EU shipping route, including commodities. Ireland, with which the US has a trade deficit of $36 billion, and where many US companies shelter much of their profits from US taxes, is also a quirk in the trade data. Drilling down into exports and imports separately, we see the imbalances more clearly: There are two categories of countries with which the US has a large trade deficit: Those that import from the US relatively little compared to their exports to the US, primarily China, Japan, and Germany; and those with which the US has a booming bilateral trade, primarily Canada and Mexico. So Canada clearly isn’t a problem in the long-running US trade fiasco. And given how much Mexico imports from the US, hounding Mexico may also be off the mark, when there should be instead a careful tweaking of the US-Mexico trade relationship. Concerning China, Japan, and Germany, however, any hounding would be appropriate. Both China and Japan have sealed off part of their market via administrative rules and laws to protect their economy from competition. The White House needs to demand reciprocity: what Chinese or Japanese companies are able to do in the US, US companies need to be able to do in China and Japan. This is currently not the case. In China, this would include being able to access the consumer base on equal footing with Chinese companies, being able to open shop without required joint-ventures and technology transfers, being able to acquire full control of Chinese companies, and the like. On top of that, the White House should deal with the incentives built into the US system that make it so profitable for Corporate America to offshore production. This is a big trade agenda for the White House. It’s 25 years overdue. And it’s not going to be welcome in those countries that have come to rely on their trade surpluses with the US as an unfailing prop under their own economies. ← The Growth Industry in 2017? Debt Restructuring & Bankruptcy! Excellent synopsis of trade deals Trump know what he’s doing only thing is the opposition who are either blatantly against this trade change for the reasons which are quiet obvious bring back jobs and have fair trade deals other wise it’s not going to work This is what the trump administration is about . That’s the point: a higher trade deficit doesn’t have to make the United States poorer. It can make the country poorer, but it can also make the country richer, and it turns out that whether the United States is richer (that is, more productive) or poorer depends on whether or not what causes the deficit also causes productive investment to rise. The debate about trade tends to have little to do with logic and much to do with ideology. On the one hand, free trade ideologues deny that the United States can ever benefit from trade intervention, and on the other, protectionists seem to think that all deficits are harmful and any reduction of the deficit creates jobs. Both sides are wrong. Trade deficits can sometimes lead to higher growth and lower unemployment, and sometimes to lower growth and higher unemployment—the same is true of trade surpluses. would you like to provide the source for the article you are quoting? Not sure if found correct source syka quoted, but if You do websearch with that exact phrase “This means that a higher trade deficit doesn’t have to make the U.S. poorer.”, You’ll find an Bloomberg article from last December which seems to be oldest relevant with that exact search phrase. There’s a bit more in-depth explanation about what syka stated earlier. Would have given You straight link but i’m not sure if that’s allowed in Wolf’s Den and it’s easy enough to find anyways. Links to Bloomberg are allowed. Most links are allowed. I do not understand. I see the formula for GDP which is what I have been told is how you determine GDP. Are you saying the formula is wrong? If imports are zero, wouldn’t GDP mathematically be higher than if imports were $2 trillion–or any high number? This doesn’t make sense to me. Would someone from NC please comment? I wonder if you are trying to say that GDP in not always an accurate indicator of well being in a country? What matters is the ‘stuff’ of trade: the US exports credit (which benefits the banks who manufacture credit at zero-cost) and the tycoons who borrow billion$ (leaving the rest of us to repay the loans). The rest of the world exports hard goods back to us made with energy and materials at a non-trivial cost. The equation you provide is for the third and least used calculation of GDP, the consumption method. (The other two are the production methods and the income methods – source:wikipedia.) In all three methods foreign production is not counted while exports are counted directly or indirectly. After all, it is Gross National PRODUCT not consumption. Consuming more than you produce can never make you richer. End of story. What is supposed to happen is as excess dollars flow out of the country the excess dollars caused the dollar to fall in value making imports more expensive and US exports cheaper. The loss of dollars also causes deflation in the home country making domestic products and costs cheaper as well. The end result is that trade balances out. This has not happened in the US since 1974, not coincidently a few years after Nixon scrapped the gold standard. If Trump were to really interfere with the Canada- US auto industry, which is one industry not two, he could accidentally bankrupt GM, for one. The he should do so today, as the world would be a better place with chinese general motors. Thoughtful Analysis Wolfman. Unfortunately the President is all up in Mexico’s stuff. Year’s ago, Warren Buffett proposed a system of import/export credits where importers had to purchase import credits from exporters who received them for every dollar of net exports. The system would keep trade in balance without Congress getting into the picture and putting tariffs on home town competitors. Not sure Wolf included citizen’s in his import statistic with Mexico. How much does illegal immigration cost the US and State government each year in entitlements (welfare, medicaid, etc.)? Let me just say this: Over the last few years, that has been net out-migration of Mexicans. In other words, more Mexicans are returning to Mexico than are coming to the US. This has a lot to do with the job markets in both countries, and the cost of living in both countries. A lot of people who come across the Mexican border are from other countries. Remittances (money that immigrants send home) are not included in the trade balance of goods and services. They’re included in the broader “Current Account” balances, that also include income from overseas, etc. Income earned in the US, welfare payments, tax payments, and a million other things are not included in the trade balance. The numbers your using to determine this are not accurate. I would bet bet my house on it. 1) The numbers for those coming in are not accurate. 2) People who return to Mexico don’t necessarily stay in Mexico. 3) There may (or may not) have been a slowdown Mexico, but this does not negate the births from Illegals and the tax that this places on the citenzenry. Probably after qualifying for social security or ssi to retire. Still a drain on US. A lot of Asians move back after saving enough to retire with servants, not that much required to do so in parts of India, Malaysia,etc. It does not mean they were suffering in US. $68 Billion sent away, never to return, except in the form of more immigrants, who need the money to buy tickets to here, or payments to coyotes. “More Mexicans are leaving…” conveniently ignores Guatemalans, Hondurans, Salvadoreans, Panamanians, Nicaraguans plus the Chinese, African and South Americans who use the Mexican border as a one way turnstile into the U.S. So no, I didn’t “conveniently ignore” – I was just showing a trend concerning Mexicans. And we agree on the rest. That is right. I have always wondered why “work force’ exports are not included in trade balance. Those are easy to calculate and come down basically to remittances. On that basis the countries that export labor would be much better off than those which import it. In case of US/Mexico trade that would add what ??? another 60 billion to Mexico’s trade surplus? Niether Germany or Japan have such surplus with the US. On the other hand a great deal of Mexico’s exports to the US should be attributed to those countries that assemble products there for the US market and these are again Germany, S.Korea and Japan. So that makes the US trade deficit with Mexico actually smaller, but add to the deficits with those three countries substantially. If you’re undocumented you’re not likely to use fake ID to apply for any of those benefits. The question is, how much in sales taxes due the end documented contribute. Right on!~ that’s what i thought right away! Versus how much does it cost to provide them with free medical, school for kids etc. One kid in school costs 6000 to 20,000 – about ten times what I pay in sales tax. Some states do not even have sales tax. I have always wondered — in a similar vein — WHEN THEY USE A FAKE ID, which to me means using someone else’s S.S.N., then the FICA payments must accrue to another person’s retirement account. Being that the illegals are working and contributing to Social Security in someone else’s identity, never to be collectible against their own Social Security number/account, should they ever get one. Someone somewhere, who is legal, must be getting some benefit from extra contributions to their account. Unless, of course, the stolen S.S. number came from the S.S. Death index. For decades I have checked my annual reported FICA contributions against my W2, to no avail. No one has ever elected to make illegal contributions to my account. Oh well. Peeps in the ag business sell their SSNs to migrants and stand to reap the benefits. Don’t ask for a link b/c I don’t recall where I read this but it was also common in the construction industry (first hand experience). What we see in the movies — that seemed too difficult to contemplate for me to do, let alone an undocumented migrant with limited language skills. Now it all makes sense. And it also answers my sad result that no one ever uses MY SSN for their illegal contributions. Tough break for me ! Lawrence Summers, not a friend of working people everywhere wrote and spoke about the “Triffin Dilemma”. Google him and it . . . .
No time to discuss it now, but it could be impossible to eliminate the trade deficit while supplying the world with its reserve currency. Triffin’s damned dilemma. Summers, as so many times, has been proven totally wrong on this issue. The euro is the second largest reserve currency, and the Eurozone has a big trade surplus with the rest of the world; The yen is a reserve currency, and the yuan is now becoming a reserve currency…. Yes, and both the Euro & the Yen are NOT global reserve currencies. If you’re serious with your comment (I’m not sure), you’re totally misinformed about global reserve currencies. For starters, check the currencies that central banks have in their foreign exchanges reserves (those are the reserve currencies). The IMF publishes this data. And then check what’s in the SDR basket and how the yuan now fits into this. This will get you started. Euro is 31% of IMF SDR while China is 11%. Of course China’s economic data is all bogus so why it’s a reserve currency is beyond me. But 30.93 (Euro)+10,92 (China) =41.85 , so the combined weight is greater than the USA. Because china bullied the IMF into putting the Cny in the SDR. Since its inclusion Cny has become more restricted not more convertible there are more clandestine currency controls on Cny than when it was first included. and teh IMF says and does nothing because its china breaking the rules again. Same as the WTO china says, times up we must be considered a market economy, even though any fool can see they are not. A situation is developing of 1 very lax rule for china, and another more stringent for for everybody else, in all world regulatory bodies. IMF isn’t the only game in town. Each country’s central bank would maintain some mix of reserves depending what are the countries trading partners. No, never the RMB. Sorry to disagree. Being a credit provider is hard, a country needs a lot of credit infrastructure which can take centuries to acquire. The British started in the 17th century for example. – A Treasury (to borrow), a national currency, a central bank (lender of last resort), strong commercial banks (strong means able to push bank losses into the local economy). – Rule of law, enforceable contracts, intellectual property rights, a predictable regulatory environment, a body of jurisprudence: trustworthiness. China has none of these things and will never be a lender to anyone not Chinese or a direct client. Ditto Russia, Turkey, Iran, Saudi Arabia: these countries are dictatorships w/ despotic, arbitrary rule where business partners disappear into dungeons or their heads are cut off with swords. World credit providers: USA (#1), UK, Japan, EU/Germany. They are the ‘Bigs’. the ‘littles’ include Hong Kong, Singapore, Switzerland, maybe Canada. It took over 150 years for the US to become a credit provider, it took a gold strike in California, several big wars including Civil War and WWI along with the accompanying manipulation of world reserve holdings by the US Treasury and JP Morgan. The US War of Independence (1776) was fought over (abusive) London credit monopoly. Most of the big wars in Europe have been fought by powers eager to escape London credit monopoly or by English trying to keep these competitors under their thumb. Give China another 100 years and see if their establishment has matured enough for their credit to be credible. I’d say no, I doubt there will be a ‘China’ maybe a couple of dozen or so warlord states. One thing all credit providers have in common is they are, every one of them, democracies. This is why the Trumpian march toward fascist absolutism is a catastrophe waiting to happen as the US economy relies absolutely on dollar credit (and US creditworthiness). “Every banker knows that if he has to prove that he is worthy of credit, however good may be his arguments, in fact his credit is gone … ” Walter Bagehot. Something to keep in mind as the US imports 8 million barrels of crude oil every single day paid for with dollar credit. There used to be a temple on a hillside not too far from Bei Jing that had a famous bonsai tree that produced a single large blossom. After Imperial China finally fell in 1911, the bonsai tree suddenly started producing multiple blooms. Many people came from far and wide to see the marvel. The naive were told that originally China had been ruled by one ruler but now it would be a democracy and ruled by everyone. The perceptive were told, on the other hand, that originally China had been ruled by one big tyrant (the emperor) but would now suffer under the oppression of many small tyrants, the warlords. For thousands of years China has broken up repeatedly but it always comes back again together into one. Don’t presume to tell the Chinese what will happen in the future. They have a far better understanding of their nation than you ever will…. I wish there was a web etiquette of quoting Summers, Rogoff, and the likes only if absolutely necessary, and then only with a reader alert. God bless Wolf for writing about this. (I would also suggest reading anything by Eamonn Fingleton). Only 6 percent of the Japanese car market is foreign cars. (US car companies sell about 14,000 cars to Japan in one year. Japan sells more than that to the US in one day). This protected market works to the benefit of Japanese companies. They can spend on R&D and CAPEX so that they can further take market share in the US. Of course the US need not concern itself with building cars, or anything else for that matter. Sending tweets is where it’s at! We could solve to deficit of importing foreign cars when the US brands build more reliable, less costly cars. It’s that simple. I buy Toyota, Honda, Audi, and Volvo for their reliability. Toyotas and Hondas are cheaper than their model counterparts, so if you want cheap and reliable, go for Honda and Toyota. Volvos and Audis are as luxurious and sporty, but more reliable than Cadillac, Lincoln, Buick. So the American brands need to improve if they want to sell more in the U.S. You can’t blame Japan for exporting so many cars into the U.S. when the people buying their cars are Americans. And my Honda Accord and Honda Civic are both made in America. Honda built its plants in the US in the ’80’s to show that the problem with American manufacturers was not American workers, but the exceptionally poor quality of American management. I don’t think Hondas are so great, but they do have the best exploding air bags Japanese engineers can design. The difference between cars today comes down mostly to styling and handling, both of which Japanese car companies are falling behind. To say that they are more “reliable” is basically a worthless statement, because it only means you like them more. Fine. But your opinion is just an opinion, and isn’t the unimpeachable truth you seem to think it is. Japanes cars and machines have better across the board reliability than US and chinese cars machines. Denying the truth wont change it, something you and P 45 need to learn. As to styling the Japanese have simply reached teh point where it is no longer necessary, to style, to the western market. A rich Japanese might shrug this off but many Japanese streets are too narrow for US SUV or F-150 trucks. Note that GM makes no small cars in the US- the Pontiac Wave and Chev Aveo are Korean. The Ford Focus is the only small car made in North America and it wouldn’t exist with just the US market. It is a Ford ‘world car’ that has a small manufacturing presence in the US because it has limited sales there. Ford was planning to move Focus south because that’s where most of the costumers are. And with a small fraction of the profit per vehicle compared to an F-150, the Focus needs every savings it can get. US$ remains so high against the yen. Re: the yen and who gets to be called ‘a currency manipulator’ the odd thing about the yen is that the PM Abe and Minister of Finance Kuroda have SAID they are determined to weaken the yen. Lots of countries scheme to weaken their currencies e.g. Canada, but you’re not supposed to announce it. This is true even when its sort of OK with a partner. The US knows Japan has issues and Japan is an ally, so it looks the other way. I’ve tried to think of a more ‘correct’ example of announcing stuff that usually isn’t, but so far the metaphor is a guy on a couch with a lady announcing his next move. Clarification: the Ford Focus is the only small car made in America by either Ford or GM. I don’t know about Fiat 500. Anyone have any idea how the Incomes that goes to Ireland and other favorable havens from US Comp is treated in these figures. I suppose they are not in it since I read that Ireland’s GDP grow with more than 25 percent last year!!! If that would rightly come in US Trade the figures and GDP would look quite a bit better I suppose. To clarify I refer to the tax set up where the Intellectual Property placed in a tax efficient place for services and goods sold outside the US. Know Apple have about 250 BUSD sitting in Dublin waiting for the lower tax to come. Simple anecdote, (and I mentioned this last week), but among my Canadian friends, aquaintances, and relatives there is a new-found surge to buy Mexican products and eschew anything made in the US. The reason for this is based on Trump’s comments and tweets. He is now the face and spokesman of the American brand. I used to buy USA carpentry tools as readily as Canadian. I have now switched to Japanese, and even Tawainese tools, (when Canadian-made are not an option). German hand tools are too expensive. I assume this is going on all over the world. There is a way to effect change without getting into people’s face or publicly humiliating them as was done with Peña Nieto of Mexico. Kids are taught to walk away from bullies and that is what is being done. I have one question. When this artificial/financialized economy (on life support ZIRP) finally crashes, will there be anyone else left to blame other than Trump? The Appalachian coal mining jobs will not be coming back, nor will there be a resurgence is US steel making. Repatriated factories will be highly automated and possible trade tariffs will be further used to threaten other countries. Many Boeing orders will be switched to Airbus, especially in the mid-east. It’s going to be a helluva hangover. I bought a real, Made in America Maytag. Absolute piece of $hit. Had 3 repairs before hitting 1 year old. Buy Speed Queen, commercial quality, lasts forever. Your made in America “Maytag” is like most holley carburetors. Assembled in America, with most parts “Made in china”. Holley got pulled on it and had to label as such, from the 70’s, many other’s like harley Etc didn’t. How many 30 year old ones do you have??? they are expensive for a reason the high price is exacerbated by High US taxes on them. Ceteris parabis, imports reduce GDP as a matter of logic. But economic activity is not parabis. Imports are imbedded in C + I + G. Reduce imports, and you almost assuredly reduce the C + I + G side of the equation. So reducing imports does NOT reduce GDP on a net basis. If a US company spends $50 million on an Indian product, i(m)ports went up by $50 million. Does that mean GDP decreased by $50 million? No! Why? Because (I)nvestment also increased by $50 million, directly offsetting it. The variables in the equation are not independent and the equation is not predictive. You can’t just say if I make the Import number bigger it magically makes the GDP number lower… does not work that way. By this logic, we should not import -anything- because exports are always additive, and there’s no impact on any of the other variables in the equation… which we know to be not true. To give another example, if I spend $50 on Made-in-America Trump hats, GDP increased by $50. If I spend $50 on Made-in-Iran Trump hats, GDP increased by $0 (-$50 import, +$50 consumption), yet there is no difference in economic activity to the end user. National accounting identities are widely misunderstood and often misinterpreted. This is my understanding as well. GDP is a measure of domestic production. When we import something, we consume it, which will add to GDP via the consumption “C” variable in the equation above. Since we didn’t actually produce the import, we have to zero out the effect of consumption by subtracting imports. If the causal relationship between the trade deficit and GDP is as this article defines it to be, then the only economic policy that makes sense is to import nothing. It also means that we should maximize government spending, since this is additive. But we know this isn’t true. Maximizing government spending crowds out private investment, lowering “I.” There are dependencies between variables in this equation. Though technically correct on your GDP calc, I would argue that Government spending and Consumption should NOT be included as neither represent production. Especially Gov spending as they cannot spend without first taking and the product nothing (unless methane gas and hot air count). If we take out Gov and Consumption and track GDP over the past 50 years, that would be an interesting chart. Mmm…incorrect. Government first spends then takes. The federal government works backwards from people and state and local governments. You have to get money to spend it. The federal gov does the opposite. It spends the money then taxes it back. And all those complaining about a future trade war. We’ve been in one for 25 years only we have failed to participate. Instead we bend over and take it and now its so far gone no amount of medication will sooth the burn. Burn all trade agreements and start from scratch. China, Japan and Germany either can come around or it’s their turn for that giant sucking sound. As for reserve currency status, it all its cracked up to be. Trump is messing with the greatest scam going. The Fed prints trillions of dollars, $500B end up overseas every year via the US trade deficit. The US gets it’s gizmo’s, oil, and bunch of really useful stuff, all in exchange for dollars printed by the Fed. When the US defaults on it’s promises, ie Treasury’s, all the foreign holders of this debt are going to get shafted. And the US ends up with a lot of stuff, for nothing, except for a bunch of pissed off countries, some of whom have nuclear weapons.. The US could easily reduce its trade deficit by using energy more efficiently. Every SUV and pickup guzzling gas is gas that is bought on the margin from outside the country. No other civilized country is so uncivilized when it comes to driving irresponsibly. Roughly $100 billion of the deficit is oil (lower because of lower oil prices than it was). Doesn’t sound like much, but with conservation the US could be running an oil exporting business. But no…. can’t give up the pickup style of life … well that is why there is a trade deficit, that and the US love of consumption of all kinds of crap. Just look at the storage business to see how overflowing with crap people are. Other countries don’t/can’t do this. Maybe the US should have a huge garage sale for the rest of the world. 40% of the SUV guzzling gas hogs energy is bought outside the country. US produces apporx. 60% of what they burn…for now. 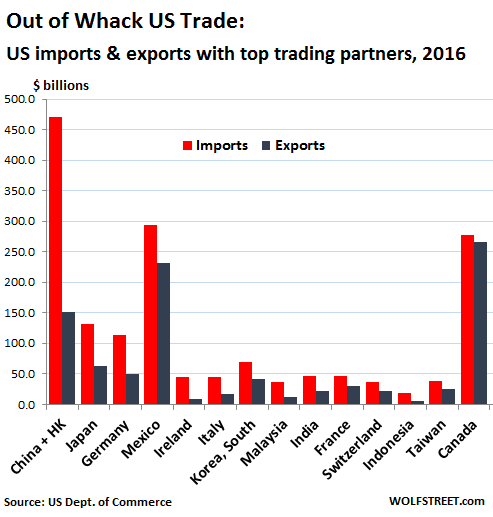 There is a much better way to balance trade than fighting a trade war. The three biggest abusers of the trade imbalance with the US, China, Japan and Germany all benefit greatly from the US military presence in their part of the world. The others benefit as well, but a reduced military presence by the US would force these countries to work out better relationships with their neighbors and spend more money on their own defense pulling investment away from their exporting industries. And we could reduce military costs without reducing military readiness, and fuel our export industry with tax cuts. We need leaders who can think outside the box. Not only from the savings of not having to spend on defense but also the MASSIVE amount of funds the US Military community spends in the host country. The rest of the World hates our guts but loves our money. And like any good grafter, they are getting really pissed thinking Trump will turn off the faucet. In what sense does China benefit from US military presence in East Asia? The wording of the Japanese constitution does not concern the CPC anywhere near as much as near-encirclement by forward-deployed American troops. The US Navy keeps the sea lanes open for traffic for just about every nation on the planet. Iran and North Korea are the only two countries that I can imagine that might be intercepted or blocked from free shipping by the US Navy, and they are rogue nations. The US also keeps a lid on tensions between countries that don’t like each other that much, such as South Korea and Japan. If the US really did just pack up and leave the western Pacific Rim, I’d expect that Japan, South Korea, and Taiwan would all go nuclear in six months to a year. All four nations have claims that overlap in the South China sea and adjacent waters. Four nuclear powers claiming the same seabed – what could possibly be the result? China might regret trying to become the local hegemon, because then they would be forced to deal with not just North Korea, but all of the squabbling nations that hate each other and also hate China. Thank you for this site Wolf. Your article and all the replies are food for thought as far as I am concerned. You truly have one of the best sites on the internet. Please keep up the excellent work. Why would the CPC agree to this? It’s composed of individuals who personally own and benefit from the industries which foreigners would like to horn in on. They have every incentive to continue the status quo while making some apparent concessions (yes, Apple can directly own a factory in a SEZ- now you can’t say we haven’t liberalised) that don’t actually affect the grand scheme. I don’t see what leverage the US has here- trade war with China means instant shortages of rare earth metals, electronic components, many pharmaceuticals and petrochemical intermediates, etc. Small but important point, most rare earths are not really that rare. They can be found in many places — not only China. (1) Is any given R.E. deposit commercially viable ? Well, if it’s a militarily strategic metal, commercial viability might be a bit less important. (2) Because R.E. metals are expensive and difficult to extract from ore, the extraction business can be very dirty if clean regulations are ignored. Which is one thing at which China excels. Nothing we can ( or should ) do about that in the USA. Titanium is the 7th most common element in the crust, according to the link above.. However, like the not so rare earths, it is very expensive and quite difficult to extract, refine, purify. The person who discovers an inexpensive way to refine titanium will become richer than Bezos or Musk. The point of this rambling post is simply that China has no grip on the rare earth supply, they are just more willing than the USA and Canada to spend what it takes to get it. Including the expenditure of continuously polluting the Chinese country. TO Brittle, and hard (lacking in ductility(it also grains like bissalloy)). To be used as much beyond blender in alloys (aircraft grade aluminum ( try drilling holes in it, with a standard drill bit)))and in cutting tool’s (which will chip and shatter if handled the wrong way). Aside from poorly phrased tweets, Trump doesn’t use a computer, nor the internet, and famously detests reading. Alternative energy, biomedical, 3d manufacturing, Robots, AI …. these are all 21st century industries the US should be investing in and dominating. A few megacorps are doing just that (Apple, Amazon, Facebook, Tesla ect…) ….but if the political climate in the US continues down the path of hostility and radicalization, they are under no obligation to continue investing in a sinking ship and can move to greener pastures (ie. such as Canada). As for Amazon, Amazon is Amazon all over the world. In China, as well, I imagine ( not really sure ). Mr. Ma says that Alibaba is not “the Chinese Amazon” . But I think I see things that show that it is. With arms sales included in export numbers, that paints a sorry picture of the state of US industry. The nominal figures quoted a quite misleadning. The real value of China’s trade with the USA is less than 1% of Chinese GDP–hardly worth worrying about. Exports make up 18% of Chinese GDP; exports to the US make up 18% of that; and the retained value of those exports is about 18% of that. China’s retained value is low because most Chinese exports are actually re-exports and contain a high percentage of American I.P. China, by contrast, retains about 9% of the value of an exported iPhone, for example. The retained value of American exports to China, on the other hand, is 100% because the U.S. owns 100% of their I.P. – from genetically modified seeds to CPUs and genome analyzers. So trade between the two is roughly in balance. retained value is just another definition for margin. I am sure American exporters would be thrilled to know they sell to china at zero cost or a margin of 100%. The simple fact is that free trade is a misnomer when it comes to to the US and its trading partners.Whether you like Trump or not ,he is %100 correct that we have done a poor job of negotiating our various trade treaties.His chief trade rep,Peter Navarro is rabidly anti-Chinese relative to trade.Whether is comes in the form of a border tax or a trade war,the probability is that something significant is going to happen during the next four years. I always thought that we should deport the illegals and send their countries the bill. If they pay us great, if not deduct the cost from the payments they get from us — Whatever they may be. This would help us with the balance of trade with Mexico mostly, but also with the rest of the countries on the list. It is also a fairer system, the abusers pay more. As a New Yorker, I saw illegal from around the world, lots of Chinese, Indians, Irish, Russians , Israelis, etc. In Florida is was mostly Latinos, but the rest were represented as well. One thought that I never hear about: instead of looking at a trade deficit in dollars, why not in labor-hours of work? So suppose a big US-Flag corporation has a factory in outer nowhere. It ships raw materials valued at $1000 over there, and 1000 person hours are applied to these materials, at 50 cents an hour, that nominally adds a value of $500. So $1500 worth of materials are shipped back, that’s a ‘deficit’ of $500. But the US market lost 1000 hours of labor employment – possibly worth $20,000 – and the impact on the US labor market would be much greater than if we had exported $1000 worth of bauxite and imported $1500 worth of potassium. And with vertically integrated companies, what’s to stop them from claiming that the value added by their overseas labor intensive factories is zero? 1) They ship us stuff and we give them green paper. We use and enjoy their goodies, they stash the green paper in their vaults. 2) On a more serious note. Throughout history less developed countries embarked on the protectionism path. USA did during Alexander Hamilton’s times. This was a necessary measure to shield infant industries from a better developed ones in Britain. Arguably, without such measures industries in a developing country has no chance. It’s like pairing an amateur light weight boxes with a heavy weight pro. In this context China is different from Japan. So from their perspective they view these barriers as necessary steps to plain the level field. Just got back from my local discount store, which carries merchandise from around the world. Lots of empty shelves. The local thrift store also has a lot less inventory. Can’t figure out if they are selling everything or not stocking due to the economy. The low inventories have been noticeable since the Xmas season started. I have noticed that too, everywhere. Even on Duval Street, the Rodeo Drive of KW, the shelves are slim. Sellers everywhere are saying the same thing, down 30% from last year is the average I am told which happens to be the same amount we are down. Even the wealthy seem to tight. Could be they already have bought everything they need…hahaha Everyone else is in debt to the waist line. Pro Trump retailers were boycotting the end of the Obama economy and hoarding their purchases for the Trumpian. It’s talked about a lot on various alternative media. They waited until the first of February to order stuff. It’ll be on the shelves soon. Year after year, we heard this from economists and politicians. Indeed Wolf and we still do in spades. Great article if one believes the theist…would seem some readers do not. I do. I go back to what I have said before, we…citizens of the USA have financed, with our hard earned money, the success of other countries at our own expense via 401K and the rest. God forbid one should say that or be labeled as conservative or anti American nut. We are brainwashed into thinking we need to help some other country and their people before we help our own. After all, buying a few shared of Alababa can’t hurt. The Audi is much better car ( even if they falsified there data) than a Buick (Chinese think otherwise). This is how Americans think and the world knows it, funny we can’t see it. Corporations, and Politians for the last few decades have zero allegiance to their home country, America. Not so with just about every other country in this world and their corporations and Politians. So, there is something wrong with how Americans think, it would seem there is a death wish by their actions. The real problem is the US has “too much” money. When you can print your money, and people still take it, there is no need to go work for it. It is easier to buy stuff from overseas than to make it ourselves. They forgot to add that the US’s greatest export is really dollars. We make the best dollars of anybody. The rest of the worlds desires and craves the dollar. It is terrific for Americas. Free trade is really free. The US gets all sorts of goods from around the world and all we give in return are dollars and promises to repay dollars…which we can print on a printing press The trade is essentially free…if you think about it. With the foreigners substituting their labor for US labor, the Americans can resign to their role of being the World’s consumer and kick back and take it easy while the rest of the world world goes to work for the US. It reminds me of the line from the movie Big, with Tom Hanks where Josh is at the office playing with all the toys with his buddy and then Josh said he also gets paid to play with the toys…..both said…suckers…. Try a 5% tarif on every item imported from every counry in the world for fairness. If any country tarrifs or blocks US exports at ahigher rate match that higher rate for every import from that country. Raise the across the board tarif 1% every year to 6% until trade balances. Countries and companies wil scream but they will find a way to live with fair trade. A small-scale example would be if your state banned all goods from any of the other states. Living standards would fall dramatically as less efficient (read higher cost) in-state producers would produce the same items, but at a higher cost to you and me. You imply that our trade with Mexico is basically balanced so there is little to be gained by eliminating NAFTA. However,a huge portion of our exports are for machinery and raw materials used to build factories and supply them with parts and materials used to assemble things like cars, tires, parts. Most of the finished products are sent right back to the US. We have outsourced thousands of manufacturing jobs. If NAFTA disappeared, we would not lose these exports. They’d be redirected to build and supply US factories. I’m puzzled. The 1% have a huge trade deficit versus the 99%. They “export” far less than they “import”. Yet it doesn’t seem to cause the 1% a problem. 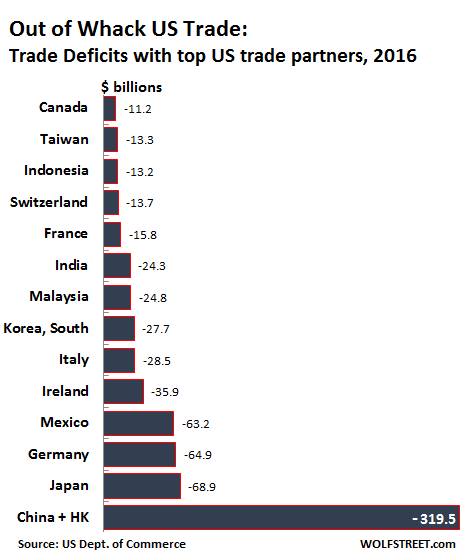 If they’ve found out how to run a continuous “trade deficit” and yet still make money, perhaps we should ask them how they do it and use the same method for the US as a whole. A lot of them make and hold most of their money outside the US, hence they bring in a little via imports. A lot of the money used to fund those imports, is in fact borrowed in the US. A variation of APPLE/Corporate, bonds sold in the US, to fund cash return’s, to shareholder’s. Both ways the interest on the US loan is tax deductible.